This entry was posted in Art, Articles, Broadcasters and tagged Chucho Valdez, Jazz, shortwave, VOA, VOA Jazz Hours, Voice of America on January 30, 2012 by Thomas. Such began the first broadcast of a small team of dedicated men transmitting live from a claustrophobic New York City studio into Nazi Germany. Their group had no name, although their first broadcast was titled Stimmen aus Amerika—Voices from America. The equipment they used was borrowed. They had no direction as to what they would broadcast, except the truth. At that moment, the United States stepped into a role as guardian of the power of ideas and honest messenger of information to all corners of the world. Today, VOA broadcasts through the Internet, television, and a network of AM, FM, and shortwave radio signals. The approximately 1500 hours of programs per week include features on American culture, learning English, international news, discussion programs, and regionally focused programs to address the needs of the local populations. VOA broadcasts in 43 languages, televising programs in 26 of those, and reaches 141 million people weekly. All this makes VOA one of the largest multimedia news organizations in the world. Read the full story at the Diplomatic Courier website. This entry was posted in Broadcasters, Current Events, News and tagged shortwave, Shortwave Broadcasters, Shortwave Programs, VOA, Voice of America, Voice of America 70 Years on January 30, 2012 by Thomas. The Winter SWL Fest is a conference of radio hobbyists of all stripes, from DC to daylight. Every year scores of hobbyists descend on the Philadelphia, Pennsylvania suburbs for a weekend of camaraderie. The Fest is sponsored by NASWA, the North American Shortwave Association, but it covers much more than just shortwave; mediumwave (AM), scanning, satellite TV, and pirate broadcasting are among the other topics that the Fest covers. Whether you’ve been to every Fest (all 25, starting with the first year at the fabled Pink & Purple Room of the Fiesta Motor Inn) or this year’s will be your first, you’re sure to find a welcome from your fellow hobbyists. For 2012, its 25th Anniversary, the Winter SWL Fest will have three days of sessions where you can learn about the latest developments in the radio listening hobbies, but there’s so much more going on. There’s a silent auction that takes place, where you’re bound to find something of interest. There’s the Hospitality Suite, where attendees partake of tuning oil and other treats and engage in spirited conversations. There is the closing Banquet, with after-dinner remarks by a luminary from the field, often one of the many broadcasters who attend the Fest, followed by the raffle, where you could win one or more of the dozens of prizes, ranging from pens from stations up to top-notch communications receivers. And of course, the infamous midnight ride of Pancho Villa that closes things out every year. Your hosts, Richard Cuff and John Figliozzi, work throughout the year to ensure that attendees have a great time over the weekend, and by all accounts, they succeed stunningly. How else could this event have lasted for 25 years (!) and draw people from around the world to southeastern Pennsylvania? Won’t you join us? If you’re interested in attending the SWL Fest, too, go to the official website and register! This entry was posted in Current Events, SWLers and tagged Plymouth Meeting PA, shortwave, SWL, SWL Fest, Winter SWLFest on January 28, 2012 by Thomas. On January 11, 2012 the National Security Agency (NSA) released a pre-1995 article entitled “Receiver Dynamics” from its classified internal magazine, Cryptologic Quarterly. It contains an excellent, well-written explanation of the specifications of shortwave receivers used by some of NSA’s K4 divisions. Download the article here (PDF). Thanks to Ed in the SWLfest list for the tip! This entry was posted in Articles and tagged HF-1000, National Security Agency, NSA, shortwave, Watkins-Johnson, WJ-8711 on January 25, 2012 by Thomas. 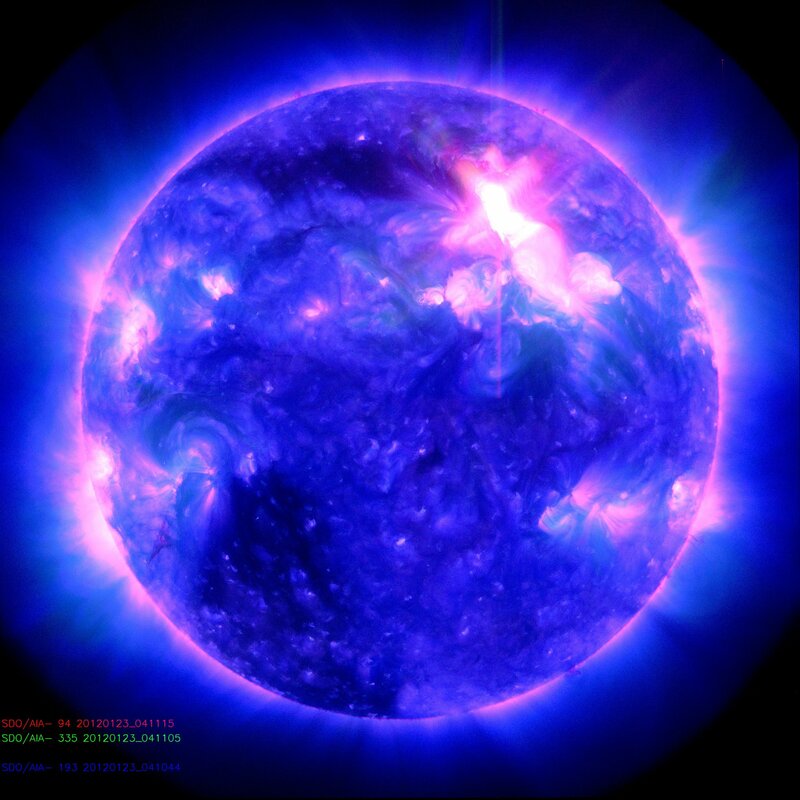 Space weather, as it is called, originates with solar magnetic activity. The sun is a giant spinning ball of charged particles. In addition to its spin, the heat released from the core through nuclear fusion eventually sets the upper layers of the sun into a kind of boiling motion called convection. All that motion — spin and convection — means lots of charged particles streaming this way and that. Since current (the flow of charges) produces magnetic fields, the outer domains of the sun are ruled by magnetism. Magnetic fields are the source of all those cool images of giant flares erupting in planet-spanning arcades of super-hot plasma. It’s also the source of so-called Coronal Mass Ejections or CMEs, which are, essentially, the space storms that space weather is all about. CMEs are eruptions of matter and magnetism from the sun into space. A typical CME will blow 10 billion kilograms (about 22 billion pounds) of solar plasma into space along with enough energy to represent a flotilla of 220 aircraft carriers moving at 500 km/s. The fact the CME’s are quite common says a lot about the power locked up in an ordinary star like the sun. While 1 to 3 CMEs may occur every day, we only the notice the ones that slam into the Earth on their journey across the solar system. When a CME crosses the Earth it runs into our planet’s own magnetic field. Charged particles from the CME get trapped by the Earth’s magnetic field and stream down toward the planet’s surface near the poles. When those CME particles, running down magnetic field lines, strike atmospheric gas atoms, the collisions cause the atoms to light up like Christmas tree bulbs. That is the origin of the simmering walls of color we called aurora. There was a time when pretty lights were all there was to space weather. Those days are over. Read the full article on NPR’s website. This entry was posted in News, Space Weather and tagged CME, Coronal Mass Ejections, NPR, shortwave, spaceweather on January 24, 2012 by Thomas.